There was a time when just the sight of those familiar white-on-black credits would make me positively giddy in anticipation of what was to follow. However, winning streaks must come to an end and after an amazing one, Woody Allen began producing one yawner (or worse) after another). 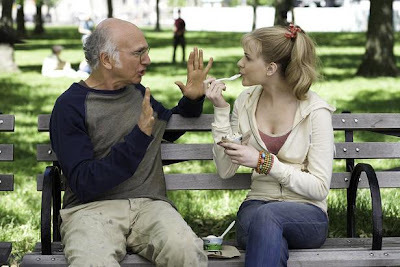 Then came word of Whatever Works and that its star would be Larry David. I couldn't help but get the old feeling again, especially when those credits start accompanied by Groucho Marx singing "Hello, I Must Be Going." Whatever Works originally was written in the 1970s as a vehicle for Zero Mostel, which makes it even more interesting that it is one of Allen's stronger recent efforts. As his films began to slip into repetitiveness after 1989's Crimes and Misdemeanors, his two best efforts, Manhattan Murder Mystery and Bullets Over Broadway, were another leftover 1970s script and a collaboration with another writer, respectively. We meet Boris expounding to his friends at an outdoor cafe on subjects such as Christianity and communism, both of which he thinks are good ideas on paper but suffer from a fatal flaw: the notion that people are fundamentally decent. Charm's not a priority for Boris, who doesn't suffer fools gladly and pretty much considers anyone who isn't him an example of a fool. While there are plenty of updated references to make it appear as if Whatever Works takes place in the present day, it still has a 1970s aura hovering over it. In fact, parts of it seem as if they might have been part of a rough draft for Annie Hall. David speaks directly to the camera and once he meets young Melodie St. Ann Celestine (Evan Rachel Wood), he tries to groom her tastes in a way somewhat reminiscent of Alvy Singer dragging Annie to The Sorrow and the Pity or giving her books to read. There is the difference that the other characters note that he's talking to the camera and think he's a little off, speaking to people they don't see. One weakness of the film is Wood's attempt at a Mississippi accent, but her character is so full of charm that eventually she overcomes it. What made me excited about this film was knowing that in the past actors who have worked with Allen have said he's not a stickler for his dialogue as long as you get the important point out. With David, the mastermind behind the brilliant improvised sitcom Curb Your Enthusiasm, starring and a cast that includes Ed Begley Jr. and Michael McKean, veterans of Christopher Guest's improvised movie comedies, I held out hope for Allen's freshest, funniest, most spontaneous comedy in a long time. Indeed, Whatever Works does provide many of those laughs. However, when characters get lines that are just setups for a punchline, more often than not they land with a thud. David doesn't do well with straight jokes, but let him riff and he's like a comedic jazz musician. This is the case with others as well. As the film starts to sag, Patricia Clarkson arrives just in time as Melodie's strict churchgoing mama and gives the film a shot of pure comic adrenaline. She has the same problem. Hers is not the type of person who would come up with punchlines. This is a character comedy and that's where the laughs do and should come from and Clarkson provides more than her fair share. Whatever Works may not end up in the pantheon of the greatest Woody Allen films, but Larry David is a perfect fit for his lead and the movie does provide more than enough laughs to make the experience worthwhile, though there is one scene in particular where I could visualize the flared nostrils and arched eyebrows that would have accompanied Mostel's performance in the part. Even better, unlike many recent comedies, it actually follows the 90-minute rule. At the film's end, Boris again speaks directly to the audience as all the characters whose lives he's affected again question what he's doing. He explains he's talking to the people who bought tickets to hear his story, if they are still out there. You can't help but wonder if that's not Woody asking out loud if he has much of an audience left after his years of misfires. If he steers back on this course, perhaps he'll woo them back.